For most people these days a smart phone or tablet is an essential every day object. We happily spend hours checking emails, glancing at Facebook or catching up on the latest news. We’ve become so attached to our devices that we even take them on holiday, wasting our precious time away from work. But what if you want to truly get away, to cut yourself off from technology, to free your mind and body to simply enjoy yourself? Where should you go and what should you do to give yourself a digital detox? Where better to start than Papua New Guinea? Here along the Sepik River it is so isolated and removed from the digital world that even general managers from luxury hotels do not have access to the internet. Instead they write things down, take notes and remember what they might want to look up online when they return to the capital, Port Moresby. In Papua New Guinea, life continues as it has for centuries, you can meet the indigenous people, talk about daily chores and listen for the calls of exotic birds. Visit a Spirit House decorated with carved ancestral figures, become immersed in the mysterious rituals of flutes and the rhythmic rattle of shell jewellery as dancers perform age-old dances. Hear tales of the not so distant past and find out how a boy only became a man by taking the head of a rival in combat. They would then boil away the flesh and hang their trophy outside their hut, soon enough everyone received the message that here a mighty warrior lived – without the need for a single Tweet. In South America technology is rampant in the cities, but all it takes to escape is a drive into the wilderness. Head to Argentina’s Patagonia with its rugged mountains, frozen glaciers and traditional gauchos; discover that life has not changed much at all over the last hundred years. These brave cowboys still herd their cattle in the traditional ways, still camp out under the stars cooking by the campfire and don’t need an iPad to while away the hours. Sit and listen to their tales, hear how their parents and grandparents tamed these wild lands, braved the freezing winters and transformed Argentina’s countryside into the home of some of the world’s finest beef. With spectacular views, fascinating individuals and a feeling of oneness with the environment you won’t sense the need to check your work email even once while you’re here. 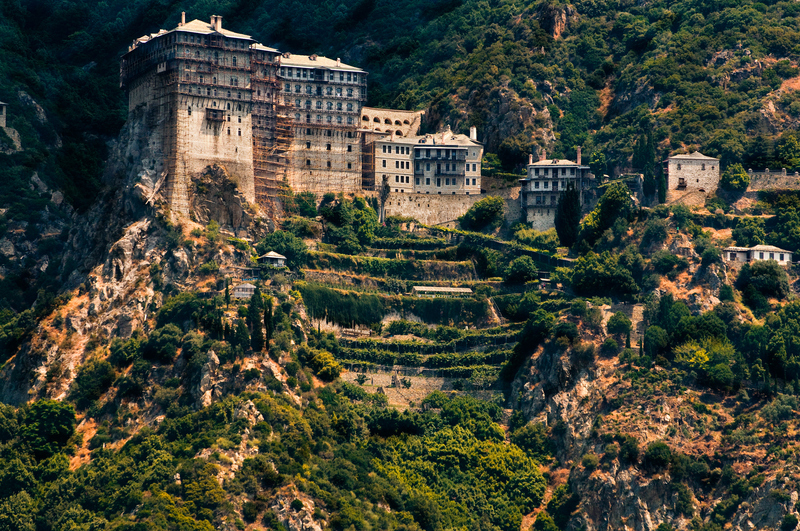 For those truly wanting a detox from modern life head to Mount Athos in Greece; well, as long as you are male. Here the Orthodox monks have secluded themselves from the world since the 7th century. So keen are they to stay disconnected that there are no televisions, no internet, only one car and they allow just 10 visitors per day from the mainland. To visit the monks on this peninsula is to truly step back in time. So much so that they have not even accepted the Gregorian calendar and still adhere rigidly to the Julian calendar, meaning Mount Athos is 13 days adrift from the rest of Greece and Europe. And as their day begins at sundown, 12 o’clock is a movable feast – being 12 hours after sunset. Therefore dawn or sunset, rather than noon or midnight are the important daily milestones. All of this means that the clocks here are constantly being adjusted and reset depending upon the seasons – all without the need for technology. During your stay at one of the 20 all male monasteries perched on the cliff face you will meet the monks, join in their daily routines and enjoy simple yet delicious meals made from ingredients grown in their own allotments. Far from the interconnected world of most of Europe, Mount Athos is wonderfully liberating. No adverts, no chain stores, only a few perfunctory shops selling basic supplies – the perfect destination to detox from digital life. If you would like to get away from the stresses of the modern world, contact Brown + Hudson to plan the perfect digital detox.